A unique structure of the club-like arm of a shrimp that looks like an armoured caterpillar, could help transform military body armour and vehicle and aircraft, says a new finding. 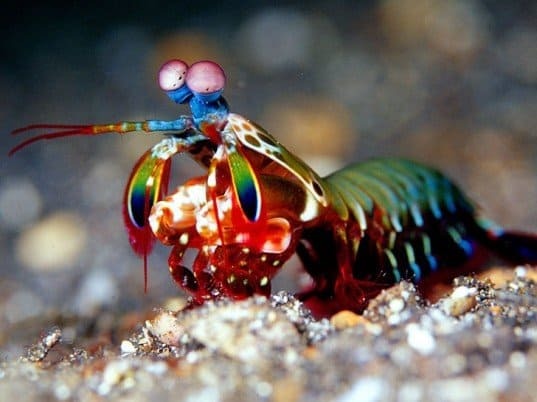 The bright orange fist-like club of the mantis shrimp, or stomatopod, a four-inch long crustacean found in tropical waters, accelerates under water faster than a 22-calibre bullet. Repeated blows can destroy mollusc shells and crab exoskeletons, both of which have been studied for decades for their impact-resistant qualities, the journal Science reported. The power of the mantis shrimp is exciting, but David Kisailus, assistant professor at the Bourns College of Engineering, University of California, Riverside and his collaborators, were interested in what enabled the club to withstand 50,000 high-velocity strikes on prey during its lifespan. Essentially, how does something withstand 50,000 bullet impacts? They found that the club is a highly complex structure, comprising three specialized regions that work together to create a structure tougher than many engineered ceramics, according to a university statement. “This club is stiff, yet it’s light-weight and tough, making it incredibly impact tolerant and interestingly, shock resistant,” Kisailus said. Kisailus said the potential applications in structural materials are widespread because the final product could be lighter weight and more impact resistant than existing products. For example, with electric cars less weight will reduce power consumption and increase driving range. With airplanes, less weight would reduce fuel costs and better impact resistance would improve reliability and cut repair bills.